About ten years ago, we spent the Christmas break on Sardinia. It was a famous family learning experience. We learned that the Mediterranean is not a warm get-away in winter. The entire island was cold, grey and wet for the whole week, and no place we stayed had any heating. We learned not to give our children dairy products before travelling. Our daughter covered the inside of the car in vomit within about five minutes of our renting it. And we learned not to buy flights just because they’re cheap. 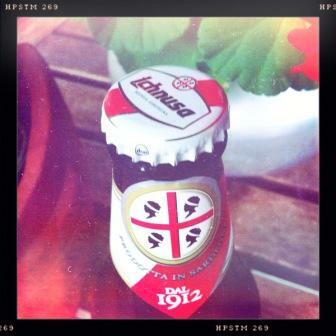 All these memories of Sardinia came rushing back when Fiona came home the other day with a bottle of Ichnusa, a beer from that ill-fated isle. Where she finds these things in Brussels, I don’t know. The taste is nothing special. It’s a typical mass-market lager with nothing much to distinguish it from hundreds of others. Still, it’s not bad. I can still find a way to enjoy it. That’s how it was with the holiday, too, really. Things like freezing rain and a chunder-mobile made no difference -- Sardinia is still very beautiful. Any holiday is still a holiday, and any beer is still a beer.